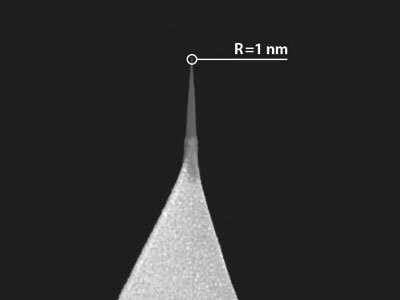 70nm Gold on both sides of the cantilever.Carbon spike not coated! Single carbon spike on silicon apex! This model features a single sharp hydrophobic diamond-like carbon extratip at the apex of gold coated silicon etched probe. There are no additional smaller extratips near the main one, just one well defined extratip.